In the last issue (no.12) in this series on protests, elections and social movements in Africa, I examined the background to the events that took place at the beginning of 2018 in Tunisia, when what appeared at first sight to be old fashioned ‘bread riots’ revealed the deep crisis of the Tunisian political economy and considered the significance of the local elections in May. In this issue, I examine the events leading up to the elections held in the DRC in December 2018 and assess the implications of the outcome. The election of the new government headed by President Felix Tshisekedi, the son of the veteran leader of the UDPS, Etienne Tshisekedi, who died in 2017, has been challenged across the country. The circumstances of the alleged ‘deal’ between the old regime and the new one, leave many asking what has really changed in the Congo. When Joseph Kabila took over the presidency of the DRC following the assassination in 2001 of his father, Laurent Kabila, few would have predicted that he would still have been in power nearly two decades later. The Constitution of the DRC limits the term of the presidency to two five year terms at most. Joseph Kabila won a competitive election in 2006 and won again in 2011, in a general election where there were widespread accusations of election rigging. Over the last two years, however, there has been continuing political turmoil in the DRC, largely associated with efforts by Kabila and his government to ensure that he would be able to stand for the third time in the next round of presidential elections, despite the constitutional provision limiting the president to two terms in office. In December 2016, when he should have stepped down, at the end of his second five-year term, Kabila and his ruling party did a deal with the opposition parties via a political dialogue facilitated by the Congolese National Episcopal conference (CENCO) which resulted in a decision that he would remain in power until the presidential elections scheduled for December 2017. This date was further postponed unilaterally to December 2018 by the National Electoral Independent commission (CENI). The likelihood of his remaining in power into a third term in reality even beyond that date appeared to have increased dramatically in February 2017, when the veteran leader of the opposition Union for Democracy and Social Progress (UDPS), Etienne Tshisekedi, died at the age of 85. The UDPS was deeply divided following Tshisekedi’s death, with some favouring his son, Felix, and others preferring other candidates. Following the decision of the Constitutional Court, a number of judges retired, giving Kabila an opportunity to appoint new ones. Many Congolese worried that the Constitutional Court –packed with new judicial appointments made by Kabila after several former judges retired – would rule that the ‘count-down’ to the next elections should be re-started, taking him past the December deadline, giving him the possibility of a third term well beyond 2018. On the other hand, there was a possibility of some real opposition to Kabila on this occasion. Two of the most influential possible candidates were banned from standing themselves, but both backed Martin Madidi Fayulu, a former oil executive, businessman and leader of a small opposition group, the Engagement for Citizenship and Development Party. On 8 June 2018, the International Criminal Court (ICC) eventually acquitted Jean Pierre Bemba, who has spent the last 10 years in prison in The Hague having been convicted of crime against humanity in 2016. The ICC overturned the previous verdict, following successive appeals by Bemba and his lawyers. In 2006, he stood against Kabila in the DRC’s first presidential election for almost half a century. Another leading opposition figure, Moise Katumbi – a businessman and former Governor of Katanga from 2007 to 2015, who remained in exile in Belgium, allegedly in fear of his life – appeared by video link at a huge rally organised by his supporters in Kinshasa on 9 June 2018, and appeared to be a real force for change. He, like Bemba, was banned from standing. Like Bemba, he too stated his support for Fayulu. On 16 June 2018, the Economist reported that the DRC was ‘catching election fever’ in anticipation of a real contest in December when the presidential elections were scheduled to take place. But, while Kabila had still not yet said whether he intended to stand or not, posters were appearing with him as ‘our candidate’, adverts had begun to appear on the TV praising the president, and in cities across the country, T-shirts bearing the president’s face were being handed out at free concerts put on by his ruling party, the People’s Party for Reconstruction and Democracy (PPRD). It was clear that, if the elections were to take place as scheduled, President Kabila would be trying as far as possible in the coming months to ensure that his candidature, if he decided to run, proved successful. Eventually, however, under enormous pressure both from outside the country and from within, Kabila decided not to stand himself, but identified Emmanuel Shadary as his preferred candidate. Shadary was selected following consultations within the ruling PPRD and the newly formed Common Front for Congo, a coalition that supported the President and for which Shadary stood as candidate. A member of parliament and the permanent secretary of the PPRD, Shadary was a not inconsiderable political persona in his own right and he truly represented the Kabila regime He had served as Minister of the Interior since December 2016, responsible for the police and security services. He had however, been placed by the European Union on a sanctions list on 29 May 2017 for his role in the arrests of opposition activists and for the disproportionate use of force since his appointment. The sanctions include a ban on entry into the EU and the freezing of assets as well as a ban on providing funds or economic resources to the persons on the list. The regime clearly saw Fayulu as the main concern. The police forcibly dispersed Fayulu’s rallies in early December, killing several people and detaining many dozens more. Polling was delayed until March 2019 in two eastern provinces which are heavily opposed to Kabila, ostensibly because of concerns about the Ebola crisis. Despite this, the presidential elections took place on schedule on 30 December 2018, with three major candidates – Joseph Kabila’s man, Emmanuel Shadary, Felix Tshisekedi and Martin Fayulu. After the polls closed, the national electoral commission stated that the official results would be released around 15 January. Fayulu had come top of a pre-election opinion poll. So, it was no surprise when a mission organized by the CENCO, that had deployed 40,000 observers to monitor the election, declared on 4 January that Fayulu had won by a good margin with more than half of the votes while Tshisekedi and Shadary were roughly tied for second place, with approximately 20 per cent of votes each. The official count and declaration by the Electoral Commission told a very different story. These indicated that Felix Tshisekedi had won with 7.05 million votes, while Martin Fayulu had garnered 6.37 million, and so came second; Shadary, according to the Commission, secured only 4.36 million votes. This came as a big surprise to many. At once there were expressions of concern. France has queried the official outcome. Fayulu himself has also proposed to make public the results of the Catholic observers and said he will formally challenge the official result in the courts. The fact that the ‘Kabila candidate’ lost so resoundingly is hardly likely to be challenged. But the fact that someone from the major opposition party in the DRC appears not only to have soundly beaten the regime’s chosen candidate but to have pushed the other opposition candidate into second place is, in reality, no surprise. Pressure had been building up in opposition to the efforts of Kabila to remain in power for more than a year, and when the UDPS, which had long-standing credibility as the major unified opposition to the Kabila regime over decades, decided to run with Etienne Tshisekedi’s son, this clearly met with widespread support among the electorate. Indeed, an October 2018 poll from the Congo Research Group found that a plurality of respondents supported Tshisekedi for the presidency, well ahead of either Shadary or Fayulu. However, this trend changed in Fayulu’s favour in December 2018, a few days prior to the elections, following Tshisekedi’s retreat from the Geneva agreement. 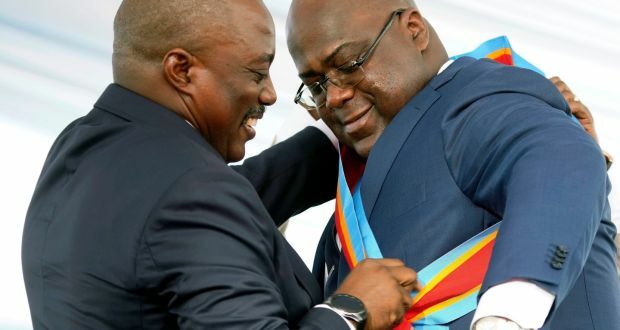 Tshisekedi made it clear that he could do business with the former regime, and many commentators have indicated that a ‘deal’ was struck between Kabila, his cronies and a new government headed by the leader of the UDPS. Kabila seemed to have no qualms about ditching his chosen successor. Head of the most important and longstanding party in the Congo’s modern history, Tshisekedi could protect the business interests and wealth accumulated by Kabila, as well as ensuring he remains immune to possible prosecution. Kabila has a lot to hide. While eighty million people struggle in serious poverty, the plunder of wealth across the vast country has continued unabated since Kabila took over after his father was murdered in 2001. Successive protest movements have shaken the country since 2016, when the president first refused to step down at the end of his legal and final term in office. Scores of demonstrators were killed in further protests in January 2018, as hundreds were arrested and imprisoned. Repression in countrywide protests over two years has been severe. There is a tendency, both within the country and abroad, to suggest that Tshisekedi will pose less of a threat to Kabila and his legacy than Fayulu would have done – some have even suggested that ‘the Kabila camp was never afraid of Félix’ (Kris Berwouts, author of ‘Congo’s Violent Peace’, cited in The Economist, 10 January 2019), implying that he will not seek to disrupt the way the state operates, but rather to collaborate with Kabila and his cronies. We can interpret Felix Tshisekedi’s statement after the official results were announced to the effect that ‘we should no longer see him (Kabila) as an adversary, but rather as a partner in democratic change’ in this way. Yet, it is my opinion that he and the UDPS genuinely believe that the DRC needs a process of gradual reform rather than a revolution – whether rightly or wrongly. This was always the UDPS way as a self-declared ‘social liberal’ and ‘social democratic’ political movement. For protestors and voters across the Congo who sacrificed so much in recent years, the current ‘deal’ is unlikely to satisfy the hunger for justice and economic transformation. David Seddon is a researcher and political activist who has written extensively on social movements, class struggles and political transitions across the developing world. In the next fortnight roape.net will be posting an interview with the Congolese scholar and activist, Charles Gimba Magha-A-Ngimba. Featured Photograph: Felix Tshisekedi receives the presidential sash from Joseph Kabila after being sworn in on 24 January, 2019 in Kinshasa (The Irish Times, 30 January, 2019). Thanks for this contribution David. The Common Front for Congo’s dominant performance in the legislative and provincial elections adds a further sense that the change in Presidential power will not lead to significant changes in governance logics or development outcomes (for which, the disastrous effects of World Bank & IMF-financed neoliberal reform must also be acknowledged). Two caveats though. First, the loyalty of the Common Front for Congo coalition to Kabila has yet to be tested, and might well prove itself to be quite weak as the tectonic plates of power begin to shift under its feet. Second, while Felix is inexperienced and unproven, UDPS is a strong party with strong followers. This was not the outcome the Kabila administration had in mind at the outset, so I think a lot remains to be seen. Look forward to the upcoming interview with Charles. Thank you Professor Seddon for clarifying the political acrobatics Kabila played in order to escape accountability from his robbery of the Congo and his human rights violations. Most incumbents in Africa amend constitutions or rig elections to stay in power in order not to face prosecution for their excesses while in power. In this case, Kabila decided to gamble on Tishikedi as his successor because he is perceived less likely to hold him accountable. A creative but still corrupt method of sabotaging the people’s will in the Congo.